R&S Metal Building Roof Curbs fit any Standing Seam, R-Panel or insulated metal panel roof. Available in aluminum, zinc-coated steel or stainless steel. Another option is the finish, which may be mill or a custom color. All curbs feature continuous seam welds. Side flanges nest with the roof panel thus resulting in a complete watertight seal. Metal roof curbs come standard with 1″ foil-face rigid insulation (R6.5). High R-values are available upon request. Curb packages ship with all accessories for a complete curb install. Engineers on staff are industry experts at quoting curb packages that will meet project requirements on time and on budget. All aluminum curbs include a 20-Year Warranty. 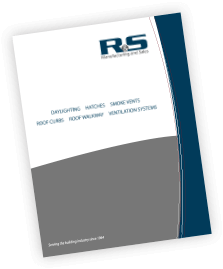 R&S manufactures a wide array of products to fit your project needs. We aim to supply all of your metal building roof accessory needs, not just one product. Why go to multiple vendors when R&S can supply it all?